I’ve just spent 5 days at the Australian Historical Association conference, held this year at the University of Queensland, and I’m all conferenced out. I won’t attempt to summarise a conference with so many papers, so many parallel sessions, so many evening events that I didn’t get to. For those who are interested, the abstracts are here and almost single-handed, Yvonne Perkins @perkinsy tweeted the conference. Instead, here are a few of my general impressions on the state of history in Australia today that I’ve picked up by osmosis during the last week. It’s probably not the most important scientific research project to come out of Queensland, but it may well be the most famous. In 2005 the University of Queensland Physics Department’s ‘pitch drop experiment’ won the Ig Nobel Prize. According to the 2002 Guinness Book of Records, it is the oldest continuously running scientific experiment in the world. It has its own YouTube site. What is the difference between a solid and a liquid? For most materials, the answer is simple – water is a liquid, ice is a solid – but for some materials, the answer is less straightforward. Which category does glass fit into, for instance? It is often thought that it flows very slowly, so that gravity gradually distorts the shape of stained glass windows so that they are discernibly thicker at the bottom. This seems to be disputed: hand-blown medieval glass panels are distorted, but it may be that cathedral builders very sensibly placed the heaviest, thickest parts of the glass on the lower side of a panel as this would be the more stable arrangement. The artist Norman Lindsay (1879-1969) had 3 sons, Jack, (1900-1990), Raymond (1903-1960) and Philip (1906-1958). They were brought up in Brisbane by their mother, and went to the Brisbane Grammar School. 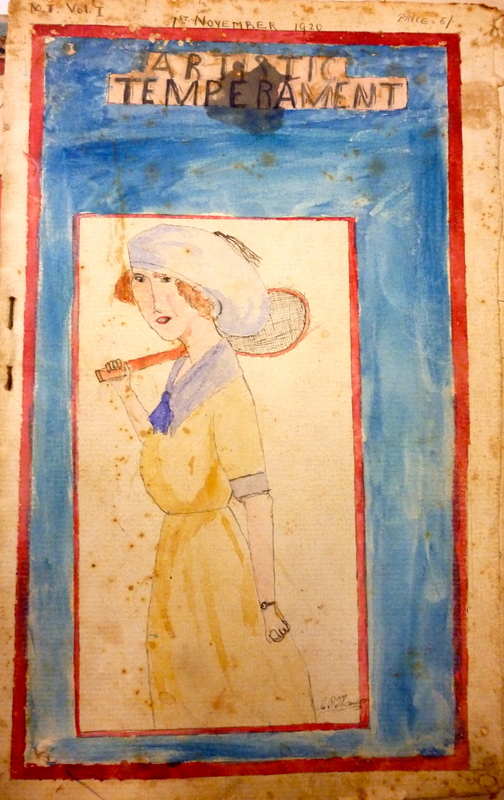 During 1920 and 1921, 14-year-old Philip produced a series of handmade, handwritten, illustrated magazines, which he called Artistic Temperament. 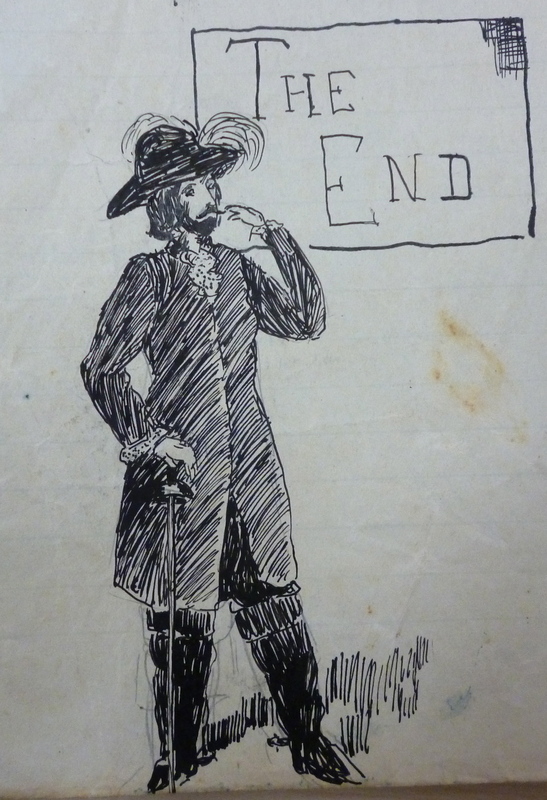 I’m not usually involved in what you might call the ‘front end’ of the historical process, the acquisition of the original manuscripts and documents on which our work as historians depends. 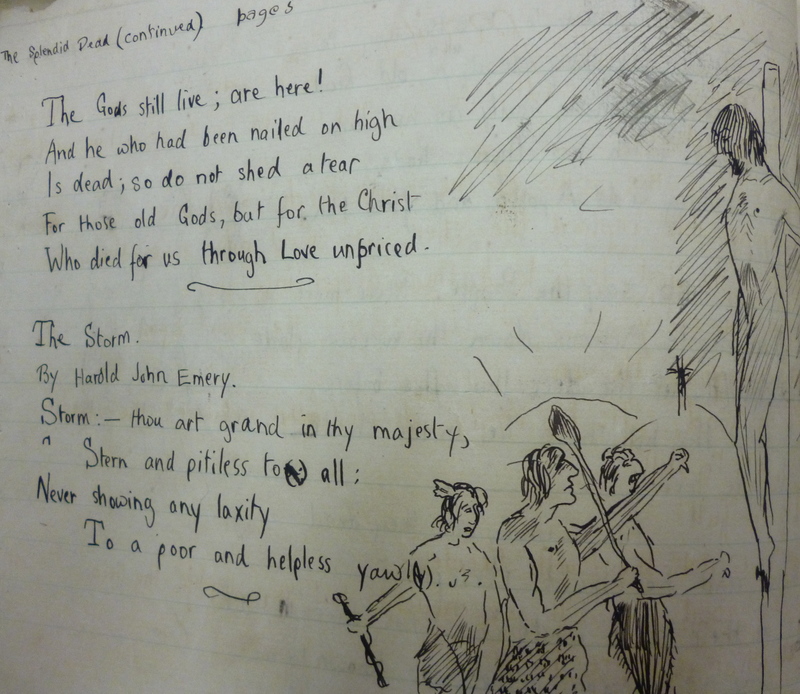 But last week I handed over a collection of Philip Lindsay’s manuscripts, the 5 volumes of Artistic Temperament, plus two other items, a school exercise book with his early stories and poems, and a 20 page hand bound play script, ‘Pierette: A Tragedy in 3 Acts’, illustrated by his brother Raymond. These documents came into my family through my great aunt Emmie, and make me sad to think that I never really knew her. She was my grandfather’s older sister, a tall, thin woman. Her nose was partly burned away by radium as a result of the reckless treatment of doctors who used it to treat anything and everything during the 1920s. As a child, I found her rather scary, but when she died, she left me her jewellery collection, a mixture of treasures and tourist souvenirs that don’t make much sense without the stories that should go with them. Amongst the collection is a gold brooch, or badge, engraved AJA. She received this to mark 50 years membership of the Australian Journalists Association. She was clearly quite a woman. Emma Powell was the first woman journalist in Brisbane. She began work for the Brisbane Telegraph in 1907, where she met Firmin McKinnon, later editor of the Brisbane Courier. They married in 1912 and became leading lights in the Brisbane literary world. Somewhere in this cultural scene, Emmie must have befriended Philip Lindsay, who entrusted her with this collection of his work. She had no children of her own, and Philip was a troubled boy. His parents had long lived apart and in January 1920, Norman divorced his reluctant wife to marry his long time mistress, and artist’s model, Rose Soady. 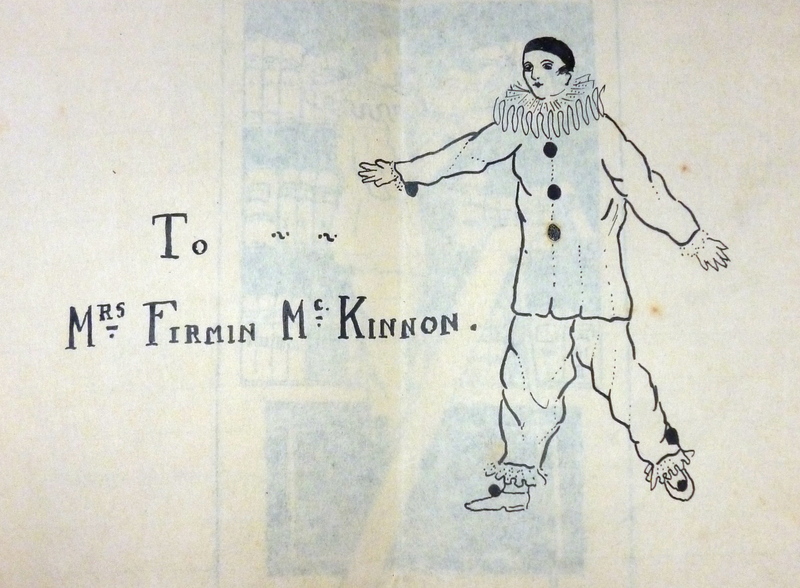 Firmin McKinnon died in 1954 and Emmie in 1965. At some point, she gave Philip Lindsay’s papers to my uncle Tony Powell. He taught German at the University of Queensland, and when he and my aunt died, my cousins gave some of his books to the Languages School. An eagle-eyed staff member there found these papers in a shoebox. Tony offered the papers to various libraries and galleries during the 1990s, but no one was interested in ‘juvenilia’. They are now. The State Library of Queensland already has a Lindsay collection, so they will fit in well. It is striking how much these youthful efforts reflect Philip’s later career as an historical novelist. His first novel was about the pirate Henry Morgan, and the pirates are already here, as are Tudor kings and queens, and ideas of medieval chivalry and honour. Norman’s influence is there in his interest in Norse mythology and Nietzsche, as well as in his misogyny (forgivable in a 14-year old boy, less so in the father). I’m glad these stories and poems have been rediscovered. I hope they reach a wider audience through the State Library of Queensland. As always, the library has too much to do, and too little to do it with, but they hope to have the collection catalogued and available later next year.